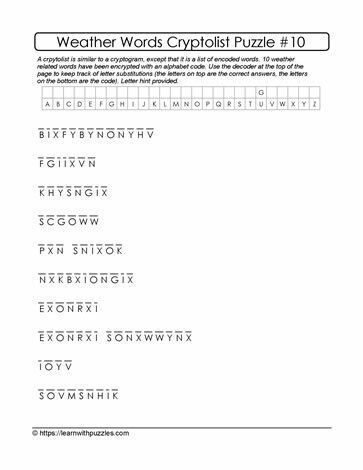 This weather cryptolist puzzle has theme related words encrypted with an alphabet code. To solve the puzzle, substitute one letter for another, starting with the letter hint. Suitable for puzzle solvers wanting to engage the brain, activate problem solving skills and to 'play with language'. Knowledge of weather words, letter patterns as well as word structures support the decoding of this puzzle.